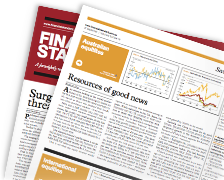 Financial Standard invites you to subscribe to FS Managed Accounts - The Journal for Managed Accounts Professionals. This site will be a centre for discussion, content and case studies for financial advisers, accountants and self-managed super fund specialists endeavouring to become best-practice managed accounts professionals. We hope you can be part of Financial Standard's journey in publishing a hiqh-quality news brand dedicated to the growth and better understanding of the managed accounts industry. Take the lead. Start receiving our annual magazine by becoming a Premium Subscriber. Go Premium.